One of the growing popular breeds in the world of dogs today is a Goldendoodle which is a cross-breed of a Golden Retriever and a Poodle. This type of dog is known for being energetic, lovable, and can surely bring joy to any pet owner’s home. If you luckily own a Goldendoodle puppy, then you would surely know that this particular type of dog is very intellectual. If you want to keep this dog entertained, you would want to stockpile the best toys for your pet. But the question is, what type of toys would be perfect for your Goldendoodles? Goldendoodle is one of the most playful dogs breeds to date. That is why when searching for the right toy, it is important to consider the physical and mental activity needs of your puppy and the type of toy will vary in meeting these needs. This type of toy is very important for Goldendoodles as they are in the teething stage. When searching for the right toy, you must consider a chew toy that will be able to soothe aching mouths, and help their gums and teeth develop, and look for chew toys that have a cleaning effect on their teeth. Puzzle toys are considered the most important type of toy for Goldendoodles because this type of dog does not need only to be entertained but they need to be intellectually challenged. Since they are intelligent dogs, they tend to become bored easily if their minds do not receive enough simulation. Goldendoodles enjoy active toys such as rope toys which can be pulled or can be shaken around. Most Goldendoodles enjoy stuffed toys such as stuffed animals or squeaky toys. They want to carry them around or lay next to them which can be very comforting to your puppies because of the softness and soothing effect it can give. Fetch toys are also a great toy for your Goldendoodles. Since they are very energetic and active, they would want to run around and fetch toys. It can be played on a field or along the beach. Chase balls, for example, is a good toy for keeping your puppy active. The Aipper Dog Puppy Toys are a pack of 10 different toys that can be enjoyed by Goldendoodle puppies. It is composed of durable interactive toys ideal for puppies such as flyer dog ropes, chewy toys, rubber bouncy balls that could also float on water, shoe toys, squeaky toys, and more. 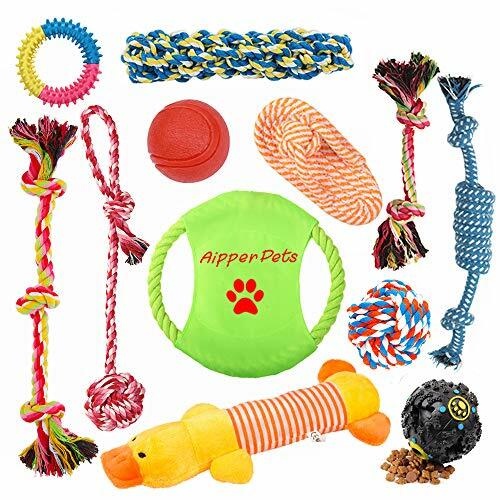 This pack of toys from Aipper can surely make your puppies entertained for a number of hours. Aside from entertainment purposes, these toys can help in the dental cleaning of your puppy’s teeth. When your dog starts to chew toys, they get their teeth clean and gums massage and can help lessen biting behavior of dogs. This pack of toys is guaranteed made of high quality and non-toxic materials which cannot be easily broken and will surely last longer. These random toys are very attractive which can easily catch the attention of your pets. This pack is ideal for both small and medium-sized dogs. Starmark is one of the most popular brands when it comes to pet education and entertainment. Their toys are designed to make puppies happy by improving the relationship with their owners. The best thing about StarMark Dog Toy is that all their products are tested and approved by the Starmark Academy Animal Behavior Center. All the StarMark toys are designed to help lessen anxiety and boredom on pets while giving hours of mental stimulation. One of its quality toy products is the Bob-A-Lot Interactive Dog Toy that comes in small and large size. The Bob-A-Lot shakes and nods while dropping dog treats as it goes. It comes in adjustable openings that can fit custom-sized and can alter difficulty which in turn provide a great interactive challenge for the dog. 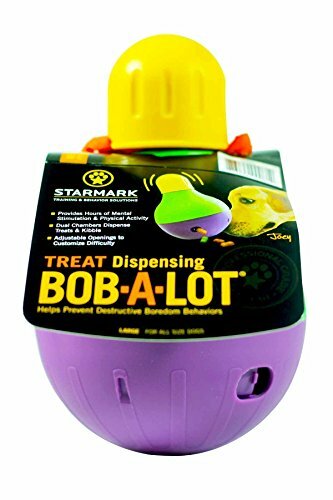 The StarMark Bob-A-Lot is an excellent feeding toy for your puppies. 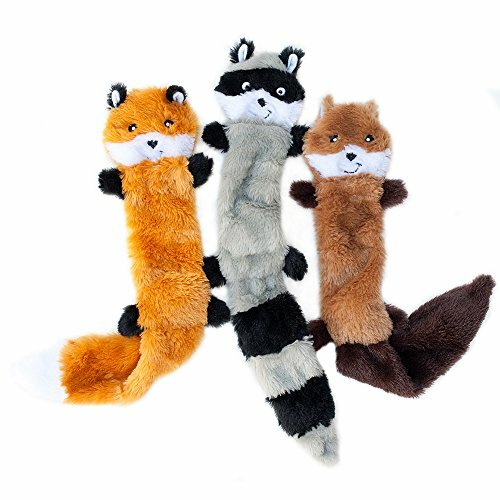 The ZippyPaws Squeaky Dog Toy comes in different lovable characters that will be able to entertain your dog for a number of hours. It mimics a raccoon, squirrel, and fox characters. This dog toy is a noisemaker type of toy that has three round squeakers that creates cute sounds when played. This skinny Peltz toys do not contain stuffing and can guarantee to last longer. This plush toy is 18 inches long which is ideal for medium dogs. Having this ZippyPaws Squeaky Dog Toy can provide more hours of fun for your Goldendoodle puppies without the hassle of messing up stuff. Goldendoodles are one of the most active and intelligent dog breeds today. Being an intelligent dog, you will need to give him proper care by providing appropriate mental and physical activities by means of toys. Each dog toy in the market serves a different purpose. Some are puzzle toys which focus on the mental ability of dogs while chase toys focus more on keeping dogs active. When buying a toy, it is important first to know which type of toy is suitable for your puppy and which type of toy is suitable for his activity needs. When you buy a different toy which does not meet his activity or learning needs, you may find it difficult to train them later on. The toys mentioned above are some of the best toys you can start playing with your Goldendoodle puppies. Also, make sure to get some good shampoo and a brush for your Goldendoodle as well.